The Global Volcanism Program has no activity reports for Spokoiny. The Global Volcanism Program has no Weekly Reports available for Spokoiny. The Global Volcanism Program has no Bulletin Reports available for Spokoiny. The dacitic-to-rhyolitic Spokoiny stratovolcano lies immediately south of Ostry volcano and NE of Iktunup volcano in the northern Sredinny Range. The volcano, also known as Kutina, was active during the early and mid-Holocene. Deposits from five eruptions during this interval have been documented, the last of which took place about 5400 years ago. Cinder cones are located on the W flank, and lava flows from the symmetrical summit cone extend down drainages to both the east and west. There is no Deformation History data available for Spokoiny. There is no Emissions History data available for Spokoiny. 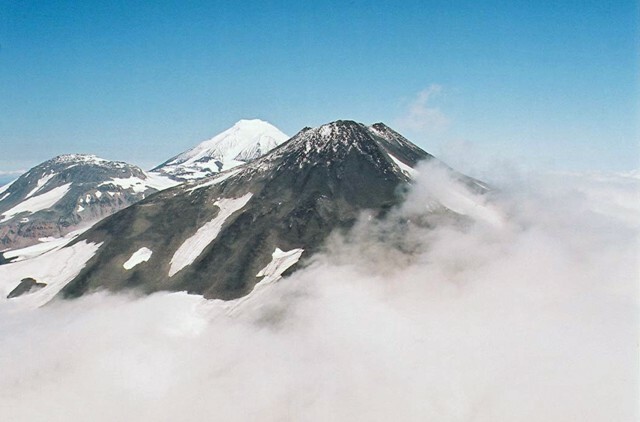 Three volcanoes in the northern Sredinny Range rise above the clouds in this helicopter view from the south. Spokoiny volcano is in the foreground, with snow-covered 2552-m-high Ostry (Ostraya) volcano, one of the highest volcanoes in the northern Sredinny Range, in the background. The rounded volcano on the west (left) flank of Ostry is an unnamed cone that was active during the Holocene. The dacitic-to-rhyolitic Spokoiny stratovolcano, seen here from the east, lies immediately south of Ostry volcano and NE of Iktunup volcano in the northern Sredinny Range. 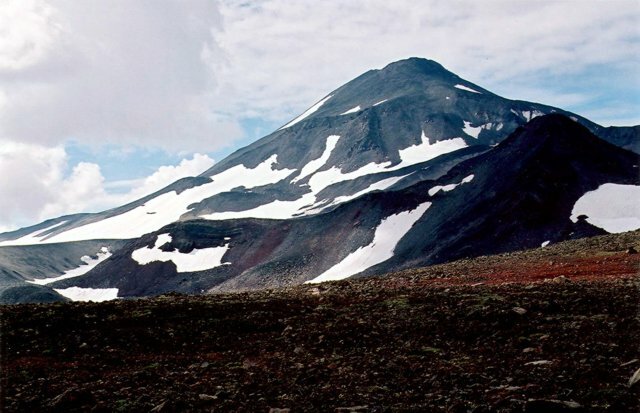 The 2171-m-high volcano, also known as Kutina, was active during the Holocene until about 5400 years ago. Lava flows from the symmetrical summit cone extend down drainages to both the east and west. There are no samples for Spokoiny in the Smithsonian's NMNH Department of Mineral Sciences Rock and Ore collection. Large Eruptions of Spokoiny Information about large Quaternary eruptions (VEI >= 4) is cataloged in the Large Magnitude Explosive Volcanic Eruptions (LaMEVE) database of the Volcano Global Risk Identification and Analysis Project (VOGRIPA).